When you see the pictures of green baby rooms shared by our visitors I believe that you will agree that green nurseries are one of the most peaceful and calming nursery designs. 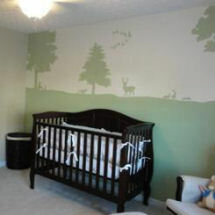 In every other bedroom of the home, it’s very popular to use all the decorating ideas and tricks in the book to "bring nature indoors".Paint colors in dramatic shades of dark blue green might be better suited to more sophisticated bedrooms, but leaf or lime green is so cheerful that you would think it a natural choice for newborn nurseries. 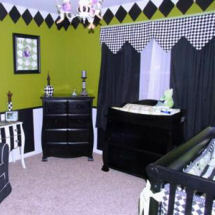 I can see no reason that green baby rooms are not at the top of the list for baby room designs. One of the decorating rules of the home states that shades of pale yellow-green should be avoided in kitchens and dining rooms due to the fact that it is not flattering to food but shouldn't be a problem in a nursery. 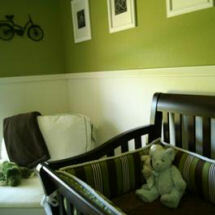 nursery decor and decorations for a green nursery. If you have been looking for pictures of a nursery decorated that will inspire you to get the ball rolling and start decorating your baby's room; look no further. 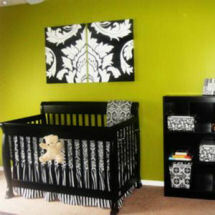 Here is a gallery of photos filled with nurseries in green for baby that are full of ideas on how to paint and decorate the nursery walls, floors and windows. 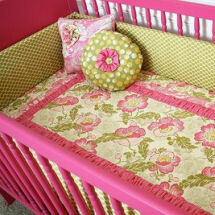 From pink and green plaid baby bed sets to toile baby bedding with green backgrounds, or crib comforters covered in flowers, there are crib sets that will lay the groundwork for green baby rooms and baby nursery decorating ideas. If you are decorating a baby boy’s nursery what could be more masculine than a hunter green fabric with a burgundy and brown print. For texture, green corduroy accents would be a lovely touch. 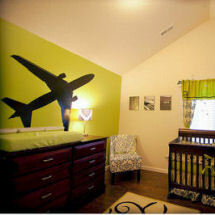 Accent your dark shades and make your green baby room livelier with punches of chartreuse or pea green. It’s possible to soften any shade of green with the addition of shades of white or pastels. To make your green more dominant and dramatic pair it with jewel tones such as crimson red, hydrangea pink or azalea purple. Green baby rooms with decorative accessories in rich colors and textured fabrics go well with Moroccan and other rich and luxurious styles of nursery decor. 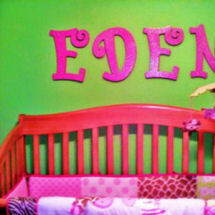 Grass green and pretty pink will take your baby’s nursery design in a more modern, contemporary direction. Mother Nature rarely makes decorating mistakes. 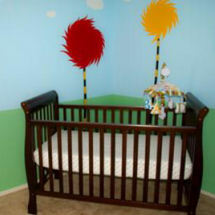 For those of us wanting the perfect blueprint for our baby’s room, maybe we should take note of the decorating ideas and advice that she shares with us free of charge before hiring a professional decorator. 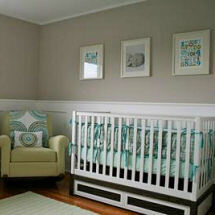 Do you have a great set of baby bedding or a picture of a nursery that you decorated in green? Share it!